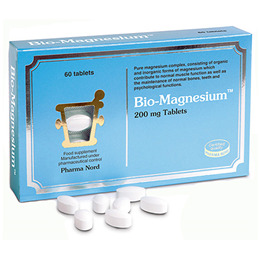 Pharma Nord Bio-Magnesium is an essential dietary mineral; although the human body contains a relatively small amount (approximately 25g, 60% of which is in the skeleton), magnesium plays a vital role in the normal functioning of the body. Magnesium supplements from Pharma Nord contain a complex of three different Magnesium compounds: acetate, hydroxide and carbonate. This ensures good bio-availability. Magnesium controls more than 300 different enzyme processes in the body, many of which play a natural role in normal muscle function, nervous system function, and psychological functions. Magnesium is also important for the maintenance of normal bones and teeth. Magnesium is a versatile mineral involved in over 300 enzyme-catalysed metabolic reactions essential for normal functioning of the body. In particular, magnesium is important for maintaining a healthy cardiovascular system, and healthy nerves and muscles. Magnesium is also important for strong bone and tooth formation, and normal skeletal development, as well as supporting normal blood clotting and the production of the body’s energy supply. 1-2 tablets per day or as professionally directed. Those with renal disease should exercise with caution when taking Bio-Magnesium. Below are reviews of Pharma Nord Bio-Magnesium 60 x 200mg Tablets by bodykind customers. If you have tried this product we'd love to hear what you think so please leave a review. I have Chronic Fatigue and these definitely help me with my energy levels. I see a marked decrease when I run out of them. Has certainly made a difference to my health!